Please welcome my friend and colleague Kelly Holland-Azarro. Kelly is our featured author for today's blog post. Kelly's Bio appears at the bottom of her article. Enjoy! Does your animal friend have fear issues? If so, you may want to consider trying the Bach Flower Remedies. Natural flower essences can be helpful with so many emotional issues, including fear based behaviors. Our animal friends can suffer from some of the same type of fears as people, fear and anxiety may include: fear of loud noises (fireworks, gunshots and thunder), separation and travel anxiety, phobias and more. What are Bach Flower Essence Remedies? Bach Flower Remedies are derived from the essence of a plant, flower, water or mineral. The essences are created by a natural process called: sunlight infusion method. Similar to homeopathy, the flower essences are safe, gentle and easy to use. The essences are typically taken in drop form diluted by way of water and placed directly on the tongue or mouth, or placed in water to drink. Flower Essence Remedies are all natural, non-toxic and do not interfere with any other treatments, therapies, supplements, herbs, oils etc. There are no side effects. Flower Essences can be used with animals and people. They are not a substitute for medical treatment. Flower essences are a supportive natural tool that can also be combined with other therapies such as acupuncture, aromatherapy, massage and energy therapies. The Bach Flower Remedies were created in the early 1900's by Dr. Edward Bach, an English physician, homeopath and bacteriologist. Dr. Bach was searching for a more natural and holistic approach to healing for his patients. He also created seven nosodes; a homeopathic alternative to vaccines. Dr. Bach passed away in 1936. All of his works and wealth of knowledge is still being shared to this day, and is preserved by the Bach Centre in Mt. Vernon, England. What are Flower Essence Remedies used for? Flower Essence Remedies are typically used for balancing emotions and negative behavior. Essences allow for a gentle shift of the negative aspect to the positive for balance and harmony. You may already be familiar with the popular flower essence remedy called 'Rescue Remedy,' which is sold world-wide in health food stores, holistic health centers and by holistic veterinarians and practitioners. Rescue Remedy is even available for purchase in some airport shops (useful for fear of flying). This flower essence combination is useful for anxiety, shock and trauma and high stress situations, and can be useful for supporting a calm and peaceful state of being. The Bach Flower Essences are also available in single remedy bottles. There are 38 remedies total. The individual flower essences are useful for a wide-range of issues and imbalances. For this article we will focus on Fear issues. Red Chestnut: over-concern for others, family members etc. With the use of any of the flower essence remedies it is important to note that they are not a substitute for medical or emergency care. Remedies should be used as a supportive and complimentary tool. Fear issues are a constant part of life, and certain anxious-type behavior may need the use of these supportive tools on an as needed and continued basis. We must also take into consideration any outside factors that may be contributing to the anxiety and fear issues and behaviors. Consulting with a professional Bach Flower Practitioner is one of the best ways to ensure that correct flower essences are chosen for you or your animal friend/s. A Bach Flower Practitioner will take the time to do a complete consultation and evaluation and work with the client to select the proper flower essence remedies for home use. Kelly Holland-Azarro is a Registered Aromatherapist, Certified Clinical Aromatherapy Practitioner, Certified Bach Flower Practitioner, Licensed Massage Therapist, Reiki Practitioner, Past Vice President (NAHA) and current Past President of NAHA (National Association for Holistic Aromatherapy). Kelly has over 20 years professional experience in holistic aromatherapy and massage therapies for both people and their pets. 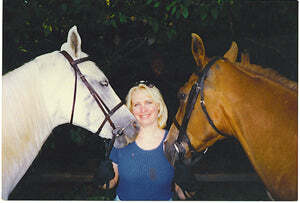 She offers NCBTMB CEU Approved courses in Animal Aromatherapy and Flower Essences. Kelly is the Founder and Director of The Holistic Animal Association (H.A.A.) Network- 'Supporting the Holistic Healing Arts for People and Their Animal Friends' and also sponsors adoptions. Hope you enjoyed Kelly's post about using Bach Flowers with Animals for Fear Issues. Thanks for being here! If you enjoyed this article please share with your friends.